Day one of Composites 2012 is in the history books, and it was a rousing success for Huber Engineered Materials. Thanks to everyone attending the event who stopped by booth 715 to see us live! It was great seeing some familar faces and some we got to know for the first time. A lot of discussion today at Huber’s booth centered around MoldX® A100 and A105, two products making headlines as both high performing fire retardant additives work well in polyester composite systems, and MoldX A105 is for applications such as pultrusion, which require a top size of less than 40 microns. Congratulations to Jeff Oleson from Copps Industries, who was the lucky winner of today’s drawing for the Kindle Fire! Stop by tomorrow, the last day of the show, for your chance to win. Stay tuned, more bloggin’ tomorrow! 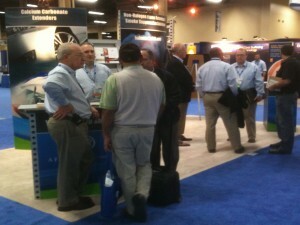 Huber personnel chatting with attendees at Composites 2012. Huber Engineered Materials has officially set-up its one-stop shop in Vegas at Composites 2012. It’s time for you to Meet Us Live! We’re located near the front entrance in booth 715. The event opens tomorrow at the Mandalay Bay Convention Center, runs through Thursday afternoon and there’s excitement in the air! Huber personnel will be discussing its high performing fire retardant additives and smoke suppressants, calcium carbonate extenders and cast polymer performance materials. It’s an exciting time at Huber and we want to talk with you! When you stop by, don’t forget…give us you business card and you’ll be entered into a daily drawing for a new Kindle Fire. Put the odds in your favor…visit Huber during Composites 2012! See Us Live in Vegas and Houston! Huber Engineered Materials is excited we will be exhibiting at Composites 2012 in Las Vegas Feb. 22-23 at the Mandalay Bay Convention Center. We will be discussing our high performing calcium carbonate extenders, fire retardant additives (alumina trihydrate, magnesium hydroxide and molybdate products) and cast polymer performance materials. See us at booth 715, give us your business card, and we will enter you in our daily drawings for a new Kindle Fire we will be giving away. At the Hilton Houston North, we will be in booth 34 at the International Polyolefins Conference Feb. 26 – 29 talking about our alumina trihydrate, magnesium hydroxide and molybdate fire retardant additives and calcium carbonate and barium sulfate products. Find out more by visiting our Ground Calcium Carbonate and Fire Retardant Additives sections, Product Finder or Contact Us right now for more information or samples. We look forward to meeing you soon! Tell the booth personnel www.hubermaterials.com sent you!